Abstract sculpture fabricated from hot-rolled, cold-rolled, and stainless steel using rudimentary equipment and fundamental techniques, such as hand-bending, forging, and form alteration with heavy striking tools. Jarred believes that steel is figuratively, and literally, the backbone of the American culture. Without steel, there is no art. 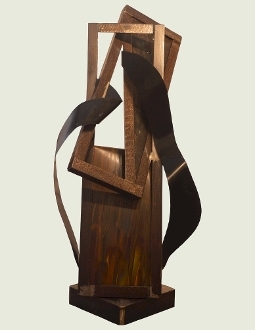 Together Forever stands 60 inches high and 26 inches wide on a 14x14 inch square base.